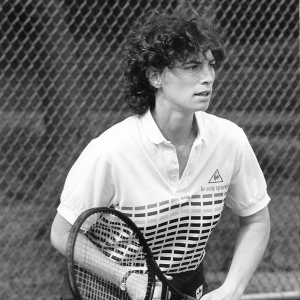 Eve Ellis, a former professional tennis player, served for four years as the National Director of the US Tennis Team for the International Maccabiah Games in Israel. A graduate of Yale University, she became the number one singles player in her freshman year and won the ECAC Doubles Championships as a junior and was elected All-Ivy. Upon graduation, she participated on the pro circuit for two years, playing doubles at Wimbledon. Growing up in the Philadelphia suburbs, she attended Friends’ Central School and, in her junior year, played number one on the boys’ varsity team and was undefeated. Both of her parents were avid tennis players, and her father continues to play a few times a week. She recalls the days when most of the tennis clubs in her area were restricted and didn’t permit Jewish membership. So her parents and other Jews in the area built their own tennis courts. Ellis began her coaching career at Friends’ Central heading the Girls’ Varsity and later became Assistant Coach of both Men and Women at Swarthmore College. In 1985, Ellis was named the US Men’s Tennis Coach at the Maccabiah Games where her players won six medals including three gold. That same year, she was named Head Coach of the Women’s Varsity Tennis Team at Columbia University. Her Columbia Lions won the NY State Championship in her third year as their coach. She continues to be a champion in the furtherance of women in competitive sports. Ellis was co-owner of The Eve Ellis School of Tennis which, for six years, served 100,000 tennis players yearly in New York’s Central Park. During that time, Ellis was named “Pro of the Year” by Tennis Pro Magazine. An investment advisor at Morgan Stanley in New York, Ellis considers herself a coach in investments and philanthropic and financial planning for families and non-profit organizations. She is on the investment committees of Jewish Women’s Archive and Rodeph Sholom in NYC and is a board member of the Ms. Foundation for Women and Maccabi USA.